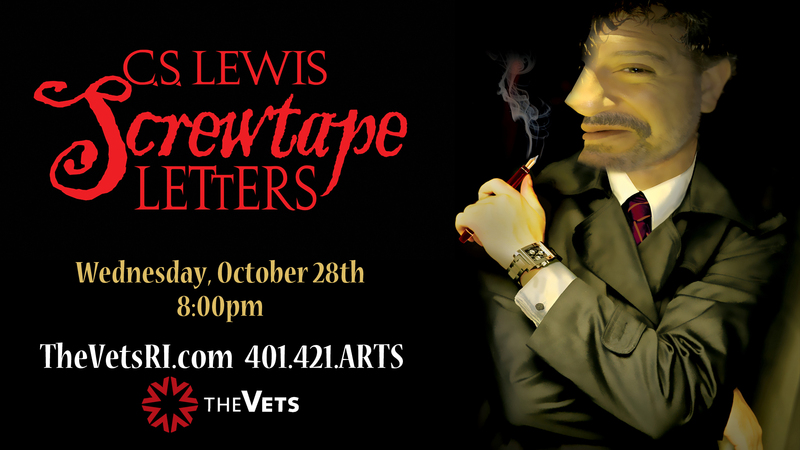 The Screwtape Letters -Providence Debut! It is a fact one of my all time favorite books, The Screwtape Letters by C.S. Lewis, has been made into a theatrical production. It is also a fact that I was thrilled to hear it would finally be coming to the stage, here in Rhode Island. The best news of all is, I will be in attendance and am thrilled to the gills (didn’t know about my gills, eh? ), that I will be able to tell you every detail of my experience in an upcoming post! So pardon my excitement, and a shout out thanks to Micheal Gravison and The Vets for making it possible. The National Tour of THE SCREWTAPE LETTERS kicked off after a hit nine-month run at the Westside Theatre in New York City where it entertained 50,000 theatergoers. Prior to that, THE SCREWTAPE LETTERS was a sold-out hit in Chicago and Washington D. C. where it ran for a combined eight months. THE SCREWTAPE LETTERS’ National Tour has delighted capacity audiences in 50 major cities including Los Angeles, San Francisco, Atlanta, Boston, Salt Lake City, Orlando, Seattle, Dallas and Houston. Over 400,000 have seen this production on tour, which continues to attract a national following. THE SCREWTAPE LETTERS creates a topsy-turvy morally inverted universe set in an eerily stylish office in hell, where God is called the “Enemy” and the devil is referred to as “Our Father below.” The play follows His Abysmal Sublimity Screwtape, Satan’s top psychiatrist (due to his profound understanding of human nature), and his slavish creature-demon Toadpipe, as they train an apprentice demon, Wormwood, on how to ruin the life and damn the soul of an unsuspecting human on earth. Screwtape is played by award winning actor, Max McLean. Along with The Chronicles of Narnia (including The Lion, The Witch and The Wardrobe), The Great Divorce and Mere Christianity, THE SCREWTAPE LETTERS is still one of Lewis’ most popular and influential works. The book’s piercing insight into human nature and the lucid and humorous way Lewis makes his readers squirm in self-recognition made it an immediate success. When first published in 1942 it brought worldwide fame to this little-known Oxford don including the cover of Time Magazine. THE SCREWTAPE LETTERS is produced by New York City based Fellowship for Performing Arts. Max McLean serves as Artistic Director. Executive Producer and General Manager is Ken Denison of Aruba Productions. Scenic Design is by Cameron Anderson, Costumes by Michael Bevins, Lighting Design by Jesse Klug, and Original Music and Sound Design by John Gromada. THE SCREWTAPE LETTERS, the provocative and wickedly funny theatrical adaptation of the C.S. Lewis novel about spiritual warfare from a demon’s point of view, comes to Providence for one performances only. The production will appear at The VETS on October 28, 2015 at 8:00pm. Tickets are $68-$38 and can be purchased online at TheVetsRI.com; by calling (401) 421.ARTS (2787) or by visiting the PPAC/The VETS Box Office located at 220 Weybosset St. in Providence. Summer Box Office hours are M-Th 10am-3pm. The VETS is located at One Avenue of the Arts. The VETS on-site Box Office is only open on show days. For more information contact Michael Gravison, The VETS, at mgravison@pfmcorp.com or 401.222.1467. Yeah, I did only see the first of the Hobbit…but of course the literature is better…except with LOTR. Because Aragorn, Legolas actually all of the characters…in the movies, are just so…memorable. LOTR fave movie! Epic.